When I left your bed at 8 PM on Monday with your beautiful family around you, I promised you that I will visit you the next morning. Perhaps you did not hear me with all the struggle you were going thru – gasping for breath. Or perhaps I should spoken up a little bit so you could hear me. The next morning came for me. But not for you. Ruffling my fingers thru your sweaty hair while you lay on the bed, it felt very strange. This was the first time – in the one year that I knew you and have visited you at least forty to fifty times – I actually went in to your room. Every single time I visited you, I found you in the common area and that is where we spent all our time. It was so strange to see you lying down without any movement. Before that you were the person who could not sit down. The only way for me to spend time with you was to walk next to you as you kept walking up and down the corridors. Purposelessly. Incessantly. Always whispering something to yourself. The only reaction I would get out of you was when I gave you a handshake. Inexplicably, you would burst into a smile. How many ever times I repeated it – that was your acknowledgement. Unfailingly. You never told me about your son and your daughter. I got to meet them for the first time on Monday night. You never told me that you were part of the armed forces. I saw the certificate in your room. For that matter you never told me anything! Or to anybody else. I learnt from your wife that at the young age of 48, you had started deteriorating. I got to know you about twenty years after that. By that time, you had lost your ability to say anything. I would ask you simple questions. You would stop. Look at me for a long time. As if you were trying to process what I had said. You would then mumble something – that was barely audible or coherent for me. I would nod. And away we would go shuffling down the narrow corridors of the hospice again. Last couple of months started being different. Your walks got slower. And for the first time, I saw you tentatively sit down and doze off in the sofa between your walks. It was there for everybody to see that you had started to slow down. Till you stopped entirely on Monday night. Ours was a relationship borne out of silence. Its strength was never rooted in words. It was in the time we spent together silently. Without a word you came into my life. Without a word you went away. But I had to put in a few words for you to remember our time together! As you know, I spend a lot of time on the road for work which means many an evening is spent grabbing a quick dinner sitting at the bar. And the days I am not traveling, usually Sharmila and I go out and get a drink. A common theme in all these settings is that I make friends with the guy or the girl behind the bar and get to know about their life stories. There is an interesting pattern there. Try it out yourself if you do not believe me. More often than not, it would be a young person in her or his twenties. They would have invariably finished their high school. After that either they could not afford college or are working at a bar to earn money to some day go to college. I know of kids (and I consider twenty year olds – kids) for whom a few thousand dollars is the difference between going to college or not going to college. A few months back, at the urging of a friend of mine – Aaron, I attended a breakfast meeting of YearUp.org. I had some familiarity with this organization from one of my prior jobs. I would recommend that you read up on them – what they do and all that if you live in the US. In short, they take kids who are done with high school and try to give them a “break” into the corporate world. Money is not the only issue with the kids. Professional skillsets is also not the only other issue. Most of them do not have the background or exposure to present themselves. They have a hard time writing a reasonably good resume. Because they have no understanding of what corporate America thinks is a “good resume”. They have little to no interviewing skills in a corporate set up. Most of them would not even know how to talk to an executive for a few minutes. That is what YearUp tries to solve for. 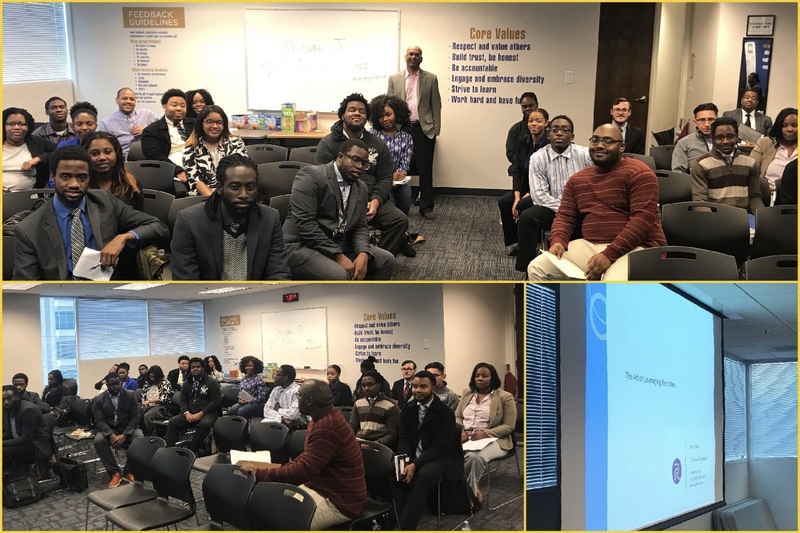 They try to give those kids some professional skills and a lot more of the soft skills and try to engage other corporations to give them an opportunity at an internship for six months. In all, as the name suggests, the full program is for a year. But there is a catch. They have strict rules for the students. No cuss words. Always formally dressed. Always carry a resume. Never be late…. If you play by the rules, the year is free to you. If you get demerits, you are thrown out of the program. Lest you think these are easy… I want to remind you that most of the students can not afford cars. One of my students takes a bus, then a train, switches to another train and then a bus again – a two and a half hour ordeal EACH WAY to go to his internship place. And he cannot afford to be late as long as he wishes to stay in the program. In any case, late last year, I enrolled myself to give my time to the cause. I came in mid stream but a few folks – like Amrutha and Carla – were very helpful in getting me inducted. I was assigned twelve students. I have to tell you – all of them have incredibly humble beginnings – one girl pushes disabled people in wheelchairs at our airport, one girl worked in the catering section of a local racetrack, one guy mows lawns, one guy worked at the backend of a local retail store… but their determination to be successful someday is jaw dropping to me. I certainly had a humble beginning myself – but nowhere near these folks. My parents gave up a lot in their lives but they always paid to make sure we got college done – even if they had to borrow money. And yet, these kids while not having that advantage, has more determination than I ever had. Ever since last November, I have been spending one on one time with these new friends of mine helping them understand how to present themselves in a corporate environment, how to behave in a corporate environment, how to write resumes, how to interview, how to think about careers and all that good stuff. I am thrilled to say that due to the efforts of Yearup, six of my twelve kids have scored jobs in the last two weeks. I am still working with the other six. If not anything else, I would ask you to just go to Yearup’s website and read up about them. They just want to create opportunities. They certainly created a few for me. Who knows? Someday you might create some opportunities for a few of their kids too!! She gave me something to think about… What do you think? Last week, I spent some time with one of my favorite friends in one of the hospice centers – let’s call her Mrs. Nancy. I walked into her room and was not sure she would have remembered me. That was surprising. In fact how our whole brain works or sometimes chooses not to work still is an enigma to me. Both Mrs. Nancy and my dad can remember certain things so well and then there are obvious things that we have to keep repeating to them! “Thank you Mrs. Nancy. He actually has had a surprisingly good progress. That was very encouraging”. “Indeed. Looks like I missed your birthday when I was gone.” I had noticed a few cards over her table. “Jan 19th”, she said after a quick thought. I opened up a couple of cards and sure enough – one stated Jan 19th. “Happy Birthday! It is your birthday today! !”, I yelled. I was not too sure why I was yelling. I was inexplicably excited. “Well, that is what we are going to do now then”. As you see in the picture, I held the cards very close to her and slowly read them out. The particularly favorite one for me was the one from her son and daughter-in-law who wrote a very touching card, I thought. In fact, I read it out a couple of times for her. (The picture is of that card). I did not realize it then, but the picture has partially caught that incredible smile that can come only from a blissful pride in your child. Later, when we were done, I packed up the cards and then settled down in my chair. Suddenly, she remembered my dad again. She can’t remember her own birthday but she remembered a person she had only heard about a couple of times. Go figure! Whoa! I am reasonably fast on my feet – even if I say so. But that one stumped me. “No”, I stammered… Too many things were swirling in my mind – the two weeks it takes for a letter to go from Atlanta to Kalyani. The missed mails. etc. But I soldiered on – “I call my parents up everyday”. I omitted the part that should have clarified “parents” mean “mom”. My dad can’t hear anything on a phone. She nodded. I figured I had made peace with her. Till she came up with the words that has been ringing in my ears – “Sometimes you should write him a card. He can read that over and over again”. I must have stared at her for a few good seconds. That is true. Phone calls are one and done. Cards and letters are forever. I know how much I cherish the letters that I have saved from my childhood. And how much I regret not saving more of them. She might have just pushed me to write to my dad. Maybe a letter every other week? What do you think? Should I do it? Would you do it for your dad or mom? Do physical pieces of memory transcend ephemeral ones like phone calls? Category: In Transit | 13 Comments on She gave me something to think about… What do you think? 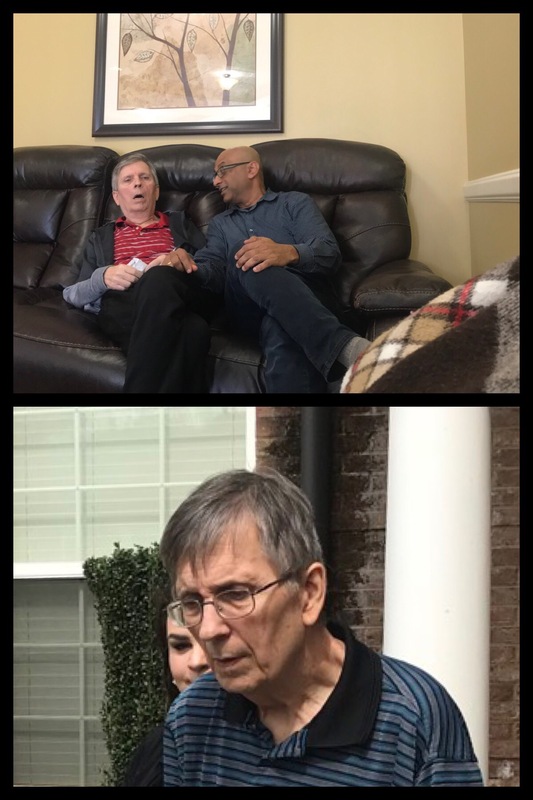 Spending time with folks who are in the last short strokes of life sometimes can be very funny, sometimes very educational and sometimes outright heart-tugging. If not anything else, watching the compassion that the patients show to each other and the employees there show to the patients, is singularly educational. I had a memorable moment day before yesterday. First let me set the context. One of my patients – a octogenarian lady – is more or less physically functional – however her short term memory is pretty much non-existent. She does move around in a wheel chair but she is able to move herself. She has three kids but I am under strict instructions not to bring the topic of two daughters up unless she happened to mention it and even then I am to just acknowledge and move on. There is a particularly painful history she has with her daughters but let me spare you of that. The son, on the other hand, is a completely different story. It was her son, as I understand, who moved her from a pretty bad situation and put her in the hospice that is very close to her house. He visits her often with his wife and kids and takes her to their place once a month. She absolutely lights up whenever anybody talks about her son. My last visit this year to any hospice was this Friday and she was my last hospice friend that I had to visit. I was expecting a 20 minute experience. Turns out, we talked for nearly an hour. She was in a very good mood. So, you ask yourself – what can you possibly talk for an hour with a stranger? First, you will be surprised how people want to tell their story if you let them. In this case, I did not have to bother about that either. She is so devoid of short term memory that an hour of conversation is pretty much twelve re-runs of the same five minute conversation. I must have answered her standard questions about my family, my daughters, where I work and so on a clear ten times or more. Similarly, she made sure I had heard about ten times about her grandchildren, their ages, her original place of birth and such other things. To break the monotony, at times, I would press further on the topic of her son – since I knew she is very proud of her. I was not sure how to avoid broaching another sensitive topic – her husband. So, I just smiled and was wondering what to ask next when she dove into the topic herself. “My husband left me after my son was born. I needed my friends to help me”. “I am sorry to hear that. But I am sure glad your friends were around.” Trying to veer away from her husband, I continued “You chose some real great friends”. She was not to be deterred. “My husband ran away with a floozie”. Okay, I do not know how you would react, but I was stumped. At that point I was hoping that she will ask me again the same questions about me that I had already answered for a few times. “That is not true?”, I asked somewhat confused. “No. A great mother raises not just a great son. A great mother raises a great father”. It took me a minute or two to realize what she was trying to say. Then it dawned on me. Her pride in her son was not how he has treated her – but how he has treated his own kids. It is not the son in him but the father in him that she feels so proud of. On the drive back from my last hospice visit of the year, I could not help think of a young lady with three kids suddenly deserted by her husband. Somehow, somewhere, she picked up her broken pieces of life and must have made a promise to herself. Although the newborn son she had was going to be bereft of a father figure in his life, she will work the hardest to make him the absolute greatest dad in the world. For sure, she would make him – in her own eyes – far superior to the man who hurt her. Boy! Did she come thru on that promise!! “A great mother raises a great father”!!! Long time back, I had read a book “Top Five Regrets of a Dying Man” by an Australian hospice nurse – Bronnie Ware who had distilled her 51 years of being around people who were waiting to die in 5 simple truths on what we regret about when we look back at life. Sometime around then, working at a hospice became an entry in my my bucket list after reading that book. First, I reasoned that it would help me set perspective for the years I have left. But more importantly, I thought there was a second part of that book Bronnie meant to write some day – what the postitive reflections are that people have once they realize that their days are numbered. You probably remember the gentleman who kept his daughter’s phone number in his hat. You may also remember the blind gentleman who was very proud of how much his kids do for him. I even have a patient who has a picture of herself with her three kids on her shelf – but I am not allowed to talk about the daughters (who as I understand are fighting unsuccessfully drug addiction and swindled their mom of a lot of money). Try talking to her about her son though and she will hold court for at least half an hour before she will come up for breath. The general sense I get is that in your last days, you realize that your kids are one of the very few things that are absolutely your own creation. Nobody else could have create exactly they way they are. And in any which way you have influenced them – your effects in this world is going to outlive you by about 30 years or even more. Lesson 2: Everybody has a story. And they want to tell it. Once a patient starts opening up, almost always it is about their past life. It is like they just want somebody to listen to their reflections. Most are very proud of what their life has been. The other day, as I was walking from the parking lot of one of the hospices to the building itself, I saw an old lady walking along with her walking stick enjoying the sun. No sooner than had I greeted her and asked her how she was doing (I did not know her at all), she stood there for thirty five minutes and gave me a synopsis of her life story. With a great sense of humor too! One of those patients who is no more (in fact, he passed away when I had gone to India to tend to my dad), used to wait for me to come the next time to tell me one more of his chapter of life. Same with the blind gentleman. Now, realize that some of those stories were not very consisten. For sure, they were biased. But the accuracy of the story is not my point. My point is, I think before they die, they want their story to be heard. They want to leave their story behind. They are proud of the unique achievements they have had and most look back with some satisfaction. But there are no avenues for them to let the world know of their story. And perhaps, they realize that with them, their story will die too. Not too many of them are going to write down autobiographies. Giving them an avenue to narrate their story the way they saw their life is an interesting “service” I have stumbled upon. One thing is for sure – each and every one of them has a story. And they are in a hurry to get it out… if you have the time to listen. Those are the two lessons for now. Would love to exchange notes with any of you who might have had similar or contrarian experiences. I will certainly keep you posted as I learn more from my association with hospice patients. “I am waiting for my son to come and pick me up”, he said grinning from ear to ear. “That is so nice. Have a great family time”. “Happy Thanksgiving to you too. I am waiting for my son in law”. This morning after my coffee and all that, I told Sharmila that I would go make the rounds in all the three hospices and try to be back before the girls wake up. I was worried that some of the patients may not be able to see their families on Thanksgiving day (some have family well outside the state). I was going to wish them a very happy Thanksgiving and if I found that somebody was not going to get the gift of family presence for one reason or the other, I was going to sit with them and perhaps spend some time with them. I am no family to any one of them but caring and companionship might count in their books, I figured. As I entered the first hospice, I sensed right away that something was different. There were a lot of the patients sitting in the atrium. Most of them were not in their shabby clothes. And everybody seemed to be wearing a smile. I was briskly walking past them to meet my own friends there when I was stopped by one of those sitting in the atrium. And that is how the conversation above came about. I went from table to table, sofa to sofa and pretty much wished everybody who was sitting there and it was more or less the same story. Everybody was waiting for their son or daughter or son in law to pick them up and take them to their homes so they could have some family time together on this Thanksgiving day. And without exception, all of them were going to come back the same night. Finally, I went and visited two of my friends who live in the assisted area side. One – who is my assigned patient was waiting for her daughter to come and wheel her out. The other – the blind old gentleman who is not an assigned patient of mine was super excited. He had a tie on and a tucked in shirt, a vest and the whole nine yards. “You must be very excited that you are going to see your family today?”, I asked. “Well. Raj, I am not going to exactly see them”, he said gesturing some air quotes with his fingers. Gosh, that could have been really really awkward for me had he not started laughing – “You know what I mean. I have gone blind. I can’t see. But yes, I am very excited.” Well, everybody was in good mood!! The scene inside the memory care unit (this is where all the folks with Alzheimer’s Parkinson’s, brain cancer, deep dementia etc stay in secured premises) was a little different. The same wishes from me about Thanksgiving had most of them staring at me. I realized that none of them had any idea that it was Thanksgiving today or had any memory of what Thanksgiving was all about. Lowell was still relentlessly pacing up and down the corridors in very small steps talking to himself incessantly. Jenny asked me to look at the red birds flying behind my head as a response to my Thanksgiving wishes. Leanne was constantly shaking even as she sat there staring at the Macy’s Thanksgiving parade put up on the TV in the common area. Then a gentleman walked in and went straight past me and sat next to a lady sleeping on a sofa on the other end of the room. She was a patient there – and I had seen her before but I had never talked to her. After about five minutes, I noticed that the lady was still sleeping and the gentleman was still sitting next to her watching the TV. He looked neither like a patient nor a staff member. Curiosity got the better of me and I went over to him and introduced myself. Found out that he was that lady’s son. She is not in a situation to go home. She cannot have Thanksgiving dinner with them. She would not even recognize any of the family members. He is the only surviving child of hers. He had come to give her company for a few hours before he went back and joined the rest of the family for their family get together. 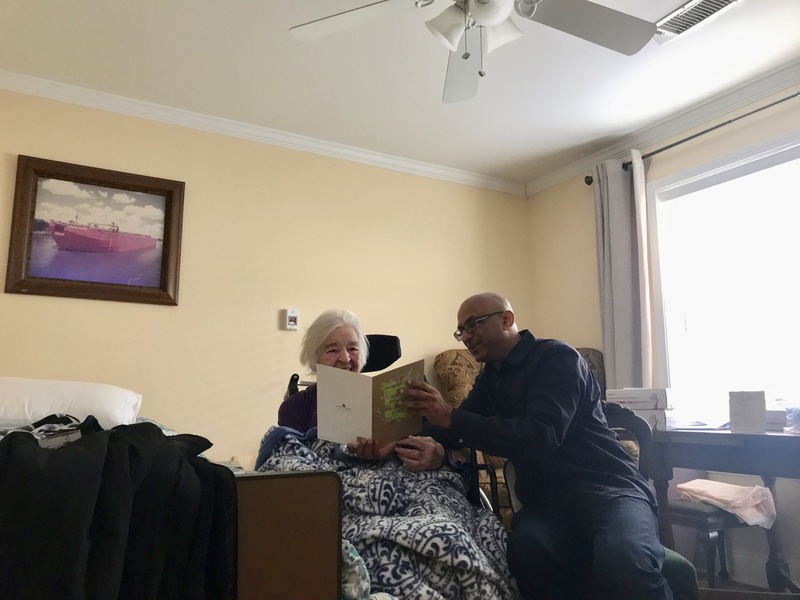 My story about learning the true spirit of Thanksgiving and family ties today will not be complete if I did not tell you about another set of people in the hospices – the staff there. Me having my big mouth obviously had to go around wishing them and asking them about their plans. I was really amazed and somewhat taken aback to realize how much adjustments they and their families made to their personal lives to accommodate the far less fortunate patients. As an example, the CNA had completed her Thanksgiving dinner the previous night with her family so she could spend the time taking care of the patients thru the day. Not one of them seemed to betray any frustration for having to work today. If anything, they seemed to be trying harder to make the patients feel happy! It is a great thing that at least once a year, we all step back from our daily lives to acknowledge our immediate and often our larger families. In this hustle bustle of modern life, it reminds us about what should be truly important to us. What if your eyesight was taken away from you? I was somewhat flummoxed about what to do next. I had just concluded visiting one of my patients in the hospice. I had gone to see a new patient that I had been just assigned but he was deep in slumber. At that hospice, those were the only two patients I had. I was wavering between whether to go back home or visit another hospice center half an hour away when I noticed a blind person shuffling along with his walking stick in the corridor. Two things stood out. First, he was reasonably well dressed – and when I say well dressed in a hospice, I mean his shirt was tucked in and his hair was combed. However, he also did not seem to know where he was going. “Yes, I am trying to get to my room”, he replied. “You live here?” I will admit, I did not think of him as a patient. “Yes. But they have changed my room. And I am all confused now”. “I think it is 5…7… something”. “Louis Armstrong” (name changed to maintain privacy). Then I walked up and down a couple of corridors and found his name tag outside room 531. “Okay. Your room number is 531. I can help you get there”. “Oh! I am just a volunteer. I spend time with patients”. “Mostly talking to them. Listening to them. Giving them company. Taking them for a walk. You know all that stuff I am allowed to do without a medical degree”. By now, we had entered his room, All this time he used his walking stick to feel his way thru and I would just tell him which way to turn. “So, you just talk to people?”. HE seemed almost incredulous. Well, that presented an interesting conundrum. He is not a patient of mine. In fact, he is not even a patient of the company I volunteer for. But what the heck? I did not have anything better to do. And the afternoon started rolling from there…. Louis was a NASA engineer. He worked on the first stage of the rocket that eventually put the first man on the moon. He also worked on the first stage of the rocket that put the shuttle into space. And he was a World War II veteran. Who served in Burma where he was shot down from the sky. Louis has gone blind slowly over the last thirty years. “Do you think it is more difficult to be born blind or go blind”? After a few seconds of thought, he said “I do not think I can compare. I do not know what being born blind is like. But I also think it is much harder if you are given something and then it is taken away from you than never been given at all. You do not know any different when you never had it to begin with”. Believe it or not, by then, it was almost an hour and a half that we had been talking. And when I say, talking – I mean he did all the talking. I was mostly listening. Finally, I let him know that I needed to go. Well then, I have to come back, don’t I? Post Script: Two days later, I went back to the same hospice. After finishing with my own patients, I went looking for him. He was not in his room. I went around all the corridors and finally found him in the common area totally immersed listening to the piano being played by a gentleman who was doing a rather good job at it, I thought. Another volunteer, like me, no doubt. I thought a lot and decided not to bother him. Felt guilty that I did not let him know that I was around. But did not want to distract him from something he was obviously enjoying either. Will go see him tomorrow. Category: In Transit | 30 Comments on What if your eyesight was taken away from you? A couple of weeks back I had written about the gentleman who would call up his daughter after painstakingly making it to the phone and fishing out the chit of paper from his hat – remember? Remember, how I had talked about the unbridled love a dad has for his daughter? Well, this is the flip side of the coin. Today, after visiting the same gentleman mentioned above, I went to visit Mrs. Ashley upstairs. I was looking forward to the conversation. To be honest, Mrs. Ashley is a nonagenarian who has been suffering from Parkinson’s from some time. She can’t hear much, she can’t talk much. So, you wonder what conversation am I talking about, right? Do not get me wrong. I love seeing Mrs. Ashley. Those big eyes – that smile that never leaves her – those nods to anything I say (mostly because she can’t hear a thing) – sometimes, those quiet moments when we watch TV together (I have no idea what I am watching and I suspect that makes two of us) – I absolutely look forward to them. But what I really look forward to is seeing her daughter – Rachel. If I visit Mrs. Ashley in the afternoon, I am guaranteed to meet Rachel. First, I want you to understand that Rachel is about twenty years older to me. Then I want you to understand that Rachel was hit with cancer. She valiantly fought back that cancer and after five long years, she came up on top of that dratted disease, very recently. I sit face to face with the lady – a patient, in her own right. “I am sorry if I am coming into a mother-daughter moment. I will come back tomorrow”, I had said the first day I ran into her. “Your mom said she is 78. That is how old my dad is!”, I had told her. As I got to know the history more, I became more and more humbled. Rachel – who is actually my mom’s age – comes and stays with her mom every single afternoon of her life. She helps her with physiotherapy, bathroom stuff and just being there with her. In fact, she and her husband moved to a house next to the hospice so that she can walk up every afternoon! “How to take care of a terminal patient”. But what I learnt most is what a daughter’s unconditional love for her mother is. Now, I am neither a daughter nor a mother. It is difficult for me to put myself in any of those positions. But I can understand from the prospective a human being selflessly giving up every day for another human being. Mind you, she just fought her own battle with cancer back!!! Driving back, my mind drifted back to my parents in India. My dad is battling a new tough battle (I will write about it tomorrow). But my first question to myself was – when will I be like Rachel? When will I learn how to selflessly love those who need our love and caring the most? I think I am going to do this hospice volunteering thing even after I get a job later. It is amazing how people who are close to dying can value any time you can give them and how what they say can break every stereotype you might have of a dying person. Take Mr. Strauss as an example. (All names made up to protect privacy). I came back from vacation and the first email that hit me this morning stated that Mr. Strauss has declined and will be transitioning soon. “Declining” and “transitioning” are euphemisms used in hospice language to let you know that you are reaching your goal line. Well, after my afternoon run, I hightailed to the hospice he was in and timidly knocked on the door. And then pushed it in. I could clearly see that Mr. Strauss was surrounded by a few relatives and had oxygen pipes running up his nose. Not sure whether to bother him and his near and dear ones in his last few hours, I tentatively asked if I could come in. You know, he did not look as bad as I thought. Clearly he was in “transition”. But he was in good spirits. As his family left, he asked me if I was leaving too. That is when I knew that the schedule of the rest of my evening was shot. (Srinivas, I hope you will understand and give me a get-out-of-jail card for this). I hung around Mr. Strauss. And I talked to him for nearly two hours. There were a lot of things he said. I am going to highlight a few of them here because I think there are learning points here. One thing he mentioned is how incredible glad he was how his five kids have turned out to be. “Raj, tears come to my eyes, to think what they have done for me”. “Well, certainly you have passed your genes to them”, said I, boosting his ego. “No. I was the tough, disciplinarian dad. I wish I was not so tough on them. I think they get it from their mom”. I find out over the next hour that he lost his wife early to Alzheimers. Never remarried. “Never be tough on your kids. They need support, not discipline”. Not totally sure how to respond, especially since one of my kids is beyond the age where I have any influence, I put out a meek “Great thoughts, Mr. Strauss”. “I never went to jail”. Guffawing my heart out, I told him “Let’s keep it that way”. I was way, way – I mean way way – over my time. Eventually, it was his dinner time. He did not let go of my hand. “Good”, said he as he released my hand. I had lied through my nose. I need him to stay alive till then. There is a pride in kids only a father can sense from another father. Gently, he opened his eyes. And then slowly, turned towards me. That was a welcome change of pace. I had come half an hour back to spend time with Mr. Loyd (names hidden to protect privacy). As soon as I entered his room, I saw the completely bedraggled figure uneasily moving around in his bed. His beard, long and unkempt, his appearance, generally unruly, he could easily pass off as an authentic homeless person – what with his multiple layers of clothes and loose pajamas – all of which have clearly seen better days. He had seen me and asked me to take him to the common area. He can walk by himself – albeit, very slowly. So, I had just shuffled along. He had very slowly sat down on a recliner and before I could find a place to settle myself in, he was deep in his nap. None the wiser, I just sat next to him. Frankly, at a complete loss what to do next. There were three other hospice patients around me who I did not know. One was making a constant low humming noise while rocking back and forth in a simple harmonic motion. One had her neck completely down and could not even lift it to see me. And an elderly gentleman was all the while sleeping in his wheel chair. I just sat there – looking at Mr Loyd. Years of alcoholism had taken its toll on the body. The pictures in his room of his younger days are almost unbelievable to fathom if you looked at his visage in the present form. His motion has become sloth like. His voice very gruff. A few words escape at a time – it is like he is still very drunk. “How are you feeling?”, I asked, moment he made eye contact with me. He said something. Very softly. “I want to call my daughter”, is the best what I could understand. “You want to talk to Grace?”, I asked. Finally, all that poring thru his life history and family members’ names in the hospice files came of use. “Okay, we will go to the front desk area and call her up”, I told him. “Will you come with me?”, he asked. As a volunteer, you know that you are looking for those cues when you have earned the patient’s trust. He seeking me to accompany him was all the positive reinforcement I needed in an otherwise excruciating test of patience. He slowly got up. When I offered him help to walk, he refused. So, he just shuffled along. And I went along behind him. “Mr. Loyd, the phone is on the other side”, I said when I saw him take a turn in the opposite direction – in fact, towards his room. “I know. I need my hat”. I had no idea why he needed his hat to make a phone call. But I knew that logic is not the way to deal with such patients. Just let them do what they want to do. Go with the flow. As long as they do not hurt themselves or others. The whole idea is to make it a painless transition. What do you know? He went to his room, struggled to his bed, reached out for a hat that was on his bed and then literally dove his head into it and then picked up his head upright – along with the hat. Of course, the next five minutes was occupied plodding on to the phone which was on the other side of the building. All the while, I was chuckling at him walking with a cane and a top hat on. Very funny, I thought. I also marveled at the fact that he held the hat steady and dove his head down into it rather than holding his head up and swinging his hat on to it. Must be his mental condition, I deduced. I realized that truism the moment we reached the phone. He reversed his motion – put his head down, took the hat out and what do you know? Inside the hat were numerous slips of paper!! One of them had his daughter’s phone number. In a flash, I realized that he stores his most precious things in his hat and he wears it around to never lose them. He recognizes that he has memory loss and that is how had adapted!!! And the strange way he wears it? To make sure the pieces of paper would not fly away!!! I was so humbled that I could slap myself. The asymmetry of our relationship could not have been more stark. I was applying logic and efficiency at every step. And he was trying to do the best with the little ability and consciousness he had. A few minutes later, I fished out his daughter’s number and rang the number. As the phone rang, I handed it to him. I hung around for a few seconds to make sure it was not a wrong number. (His scribbling is terribly illegible). But the moment I realized from his voice that he had his daughter on the line, I took a few steps away to give him some privacy. I was expecting to overhear him complain about his condition, the premises, the care given to him (patients in a hospice have very little ability to logically process how much help they are being given), the money that he cannot move in his bank. Oh! Yeah! He is given to calling up a particular branch in a particular bank to move some money that he never had. To understand the greatness of humanity, you have to understand that the hospice office once explained the situation to the bank and the bank actually plays along with him – saying they are on it… so that he can get some mental peace!! Well, as I said, I was expecting him to complain about something like he always did. But I could not help overhearing what he asked first – “Honey, were you able to get that job?”. And his response to whatever she said betrayed the fact that she had not. As I sank in a chair a few feet away from him, I was just swept up by a flood of emotions. Here is a gentleman, knocking on the doors of death with inability to do anything for himself. And yet, when he woke up from his nap and he looked at me, his first thought was not about himself – but his daughter’s well being. He was trying to find out if she had gotten a job to support herself with. I have no idea what the situation of his daughter is – I hope to learn as I talk more with Mr. Loyd. But I was overwhelmed by the fact that I was worrying myself about how he was going to get by his days with his physical condition, and all the time, he was worried about his daughter!! They all started shimmying in front of my eyes as I closed my eyelids to fight back a tear or two. Once a dad. Always a dad.